Not really a prediction, but I can't resist this story about growing strawberries in a really hostile environment. This is a snapshot of life at one of the world's strangest farms. In the eerie blue light, a diver drifts between underwater greenhouses, where the first seeds of the year – basil, strawberry, lettuce and beans – were planted last week. 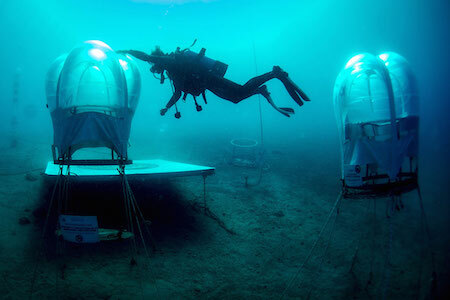 The transparent "biospheres" beneath the Bay of Noli, in Savona, Italy, are part of the three-year-old Nemo's Garden project, which aims to find innovative ways of growing crops in places that lack freshwater or fertile soil. Resembling large balloons, the air-filled structures are anchored to the sea floor and float between 5 and 10 metres below the surface. Gregory Benford thought about structurally similar lifezones, which were also pods sticking out into a hostile environment - in this case, space. He puffed heavily as he angled around the bulbous lifezones - huge bubbles extruded from the sleek lines of the Argo, like immense, bruised bodies of parasites. Inside, their opalescent walls ran with dewdrops, shimmering moist jewels hanging a bare finger's width away from hard vacuum. Green fronds pressed here and there against the stretched walls - a sight which at first had terrified him, until he understood that somehow the rubbery yet glassy stuff could take the pokes and presses of living matter without splitting.